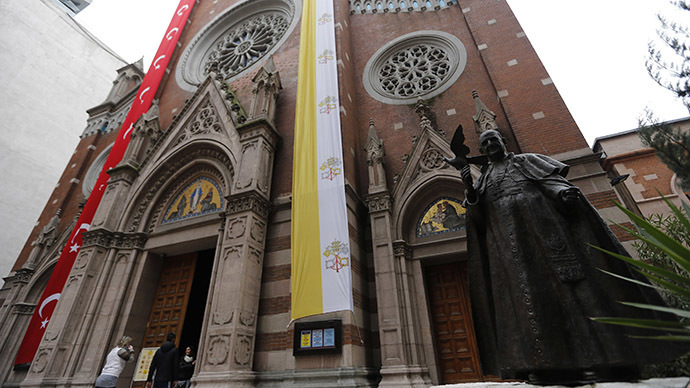 Turkish government has authorized the construction of a new church in the country. It will be the country’s first non-Muslim temple built from scratch since 1923. The government vowed to provide land for a new Christian church for Syriac community, Turkish Prime Minister Ahmet Davutoglu said on Friday in Istanbul at the meeting with representatives of non-Muslim communities. The church will be erected in Yesilkoy, Istanbul suburb, on the shore of the Marmara Sea. The place already has temples for other Christian minorities - Greek Orthodox, Armenian and Catholic churches. "It is the first since the creation of the republic," a government official told AFP. "Churches have been restored and reopened to the public, but no new church has been built until now." However, the government will not pay for construction. It will be paid by the Syriac group itself. Syriacs are ethnic and religious minority whose number is less than 20,000 mostly live the southeast of the country and tend to be attending either Orthodox or Catholic churches. Their population has grown in the past years due to numerous Syriac refugees from Iraq and Syria. Only about one percent of Turkish population of over 75 million people is not Muslim and since 1923 no new churches were built. The ruling party is often criticized for its support to Islam in secular state. However, Turkish government is changing its attitude to religious minorities, partly to comply with European Union values, and has returned some property, for instance the Mor Gabriel Monastery in Mardin to the Syriac community. "We do not consider any religious or cultural tradition as an outsider," Davutoglu said at the meeting, as cited by the Daily Sabah. The government pays equal amounts of respect to all citizens, added the Prime Minister. During his recent visit to Turkey, Pope Francis urged an end to the “hunt” for Christians and so called "Christianophobia" persecution of Christians in Syria and Iraq. In a joint service, Francis and Patriarch Bartholomew I of Constantinople called for "constructive dialogue" with Islam "based on mutual respect and friendship."